RV Parts Specials: Find What You’re Looking For! When it comes to RV parts, we have a great staff that has a great knowledge base of it all. If you’re searching for a particular part, we may just have it! Nothing is worse than finding an RV that has a broken part. Until it’s all fixed, there’s not much camping happening, so hurry in and get help from our amazing staff that genuinely desires to get you back to experiencing the great outdoors! Because of today’s ever-changing RV equipment, we always keep our staff up-to-date on efficient skills and RV parts. We look to take care of each customer and their needs, striving to fix the smallest problem to the biggest, all within a reasonable price. We are completely computerized and can tell you what we have in stock almost immediately. If we don’t have it in our stock at the moment, we can tell you how quickly we can order and get it to you. Our helpful staff can guide you through the choices, and we’ve got GREAT deals going on! From a simple ball hitch to a high tech satellite dish, we can handle all of your RV needs. We’ll give you great, low prices on the parts that you’re looking for (and any part can be exchanged for equal or lesser value). This RV parts special has three different packages you can take a look at. If you have any questions about any of these packages and desire more details, please contact our staff for more information and prices for each of these different packages. From a simple ball hitch to a high tech satellite dish, we can handle all your RV needs. Call 800-516-9058 to find the perfect part for what you are looking for. You can also contact us with any other general inquiries that you may have. From a simple ball hitch to a hitch tech satellite dish, we can handle all your RV needs! 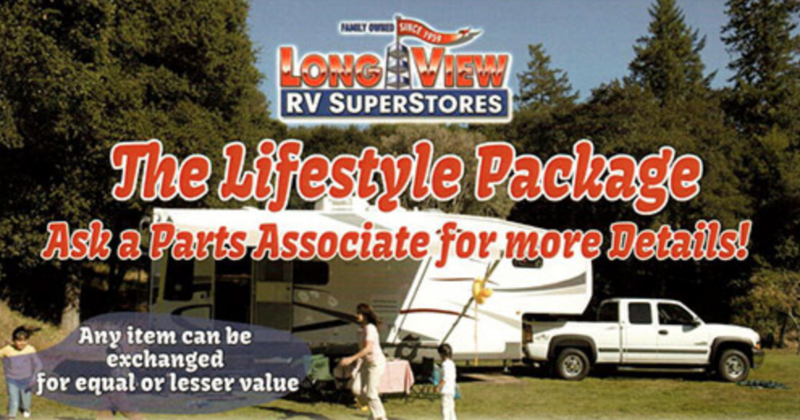 Whether you are looking for new RVs for sale or your looking for RV parts to fix and update your own recreational vehicle, Longview RV Superstores has your back!